Would you be scared off by its name, butter chicken? It sounds you might intake too much fat. No worries in fact. Although butter is one of the key ingredients that helps create a fragrant sauce that you’d love, you can reduce the amount of butter to your liking. That’s the beauty of home cooking. This recipe yields the minimum amount of butter and just right to make the sauce smooth and fragrant enough. 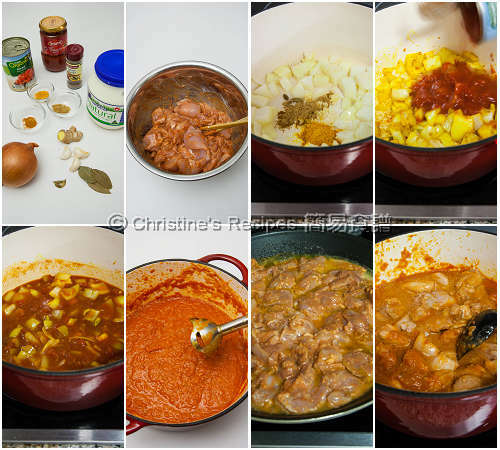 Butter chicken, a traditional Indian dish, is very popular, with many versions evolved around the world. What I like about this dish is the fragrant spices incorporated that are very good to our health. 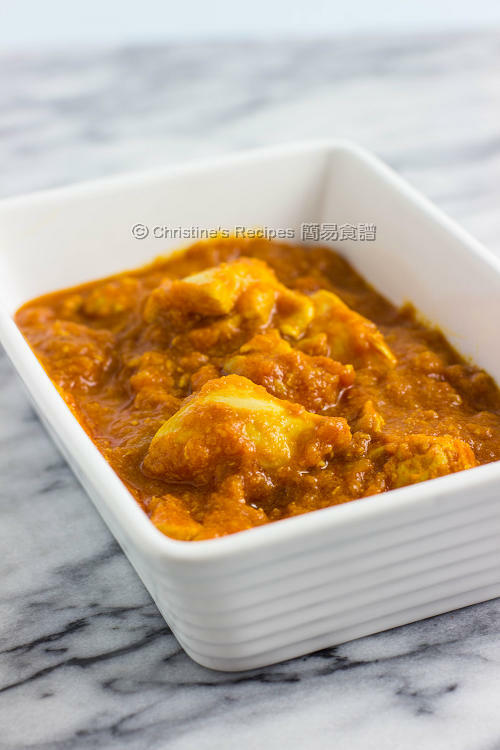 Some Indian dishes are very spicy and hot, but this butter chicken dish is quite mild. 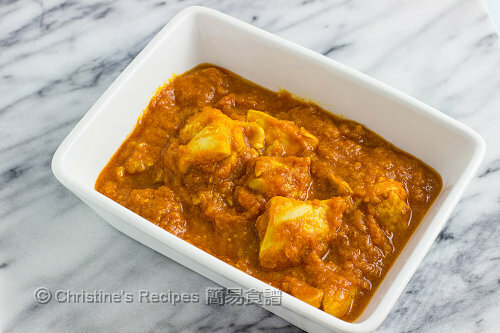 It’s a great family dish and a hit with my kid, served perfectly with naan bread or steamed rice. Cut the chicken into 3cm cubes. Mix with the marinade and set aside for 20 minutes. Heat oil in a wok or a heavy based pot. Sauté onion until aromatic. Push onion to the sides. Add some oil in the middle. Sauté garlic, turmeric powder, cardamom pods, ground coriander, garam masala and bay leaves. Stir and fry until fragrant. Pour in the diced tomatoes with sauce, and stock. Bring it to boil. Cover and cook for about 15 minutes, or until the onion turns soft. Remove from the heat and let it cool down a bit. Discard the bay leaves. Process it with a food blender into a paste. (Be careful if it’s still too hot.) Put it back on stove to reheat on medium-high. In the meantime, heat butter in a large frying pan over medium heat, when frothy, add the chicken and increase the heat to high, and cook for 5 minutes. Remove from heat and pour the chicken with the butter into the sauce. Cook until the sauce is thickened. Season with salt and sugar. Serve hot. Squeeze some lemon juice in or add yoghurt if you like. For convenience, I used tinned tomatoes. You might use fresh tomatoes instead. Make sure to choose the ripe ones that are not too tangy. Try to get the brand of yoghurt that’s not too sour. All the spices are available at supermarkets. That gravy looks so GOOD! This is usually served with naan. Very nice. Is there another method to turn the sauce into a paste without a food blender? Unfortunately, it's quite hard to make a smooth paste like this without a food blender. how much tomatoes would I use, if I am using the fresh tomatoes? You may use about the same amount of fresh tomatoes, 400 gm. Take note that the sweetness and acidity will vary depending on the ripe level of your fresh tomatoes. Please try the taste and adjust the seasonings accordingly.